Palak Paneer is an easy to prepare and one of the most loved North-Indian main dishes which is commonly on the menu during parties or functions. Palak is a vegetable which is not popular by itself but its health benefits are not unknown. This dish is a great way to get your family especially kids to have palak as they are surely going to love it. Palak Paneer is my personal favourite paneer dish as well. Fresh spinach – 250 gms. Paneer cut into square pieces – 200 gms. Now cover and cook the spinach on low flame for 3-4 mins in a pan/kadhai. Let it cool. Grind the spinach, green chillies and tomato in a mixer/grinder into a puree. Do not add water and if at all needed, add very little water. Take a heavy bottomed pan/kadhai and heat oil. Once hot, add paneer pieces and lightly roast. Take out paneer and put them on a tissue paper. In the same oil, add onions and fry till onions turn brown. Add the above prepared spinach puree, paneer pieces, salt and coriander powder. Mix gently so as to not break paneer pieces. Cook for another 2-3 minutes. Switch off the gas and top up with malai/cream. (Beat the cream a little if not smooth in texture). 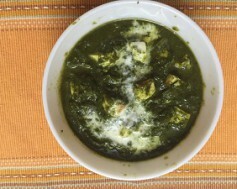 Palak Paneer is ready to be relished. Serve it with roti/paratha/rice.